Strange Beautiful Music takes listeners behind the scenes for an inside look at the life and work of guitar legend Joe Satriani. This title features music performed by the author. Included throughout the audiobook are samples of some of Satriani's most memorable songs, courtesy of Sony Music Entertainment. Oft-hailed as the Jimi Hendrix of his generation, living guitar legend Joe Satriani has long transcended stylistic boundaries with a sound that raises the bar like a new horizon for the broader genre of instrumental guitar rock. Joe's six-string secrets have astounded listeners around the world for nearly thirty years. In Strange Beautiful Music: A Musical Memoir, Satriani and coauthor, music biographer Jake Brown, take fans on their first authorized tour of the story behind his climb to stardom and the creative odyssey involved in writing and recording a storied catalog of classics, including "Surfing with the Alien," "Summer Song," "Satch Boogie," "Always With Me, Always With You," "The Extremist," "Flying in a Blue Dream," "Crowd Chant," and more. 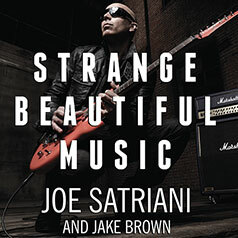 Featuring exclusive, firsthand interviews with Satriani, Strange Beautiful Music offers a unique look inside the studio with Joe, giving fans a chance to get up close and personal like never before. With insider details about his collaboration with multi-platinum supergroup Chickenfoot, exclusive interviews with Sammy Hagar and Michael Anthony of Van Halen and Chad Smith of the Red Hot Chili Peppers, commentary from fellow guitar legends such as Steve Vai, Metallica's Kirk Hammett, Primus's Larry LaLonde, and legendary music producers, including Glynn Johns and the late Andy Johns, this memoir offers a rare inside look for die-hard Satriani fans, guitar enthusiasts, and anyone who loves to rock. Strange Beautiful Music features music performed by the author. Included throughout the audiobook are samples of some of Satriani's most memorable songs, courtesy of Sony Music Entertainment.